This morning our group visited Ephesus, the site of the Temple of Aretmis, and the Ephesus Museum. In the book of Revelation, Ephesus is the first of the cities mentioned (Revelation 1:11; 2:1-7), but for our tour it was the seventh. Ephesus was also the location of much work by the Apostle Paul (Acts 19). In the afternoon we drove south to the ruins of the city of Miletus. 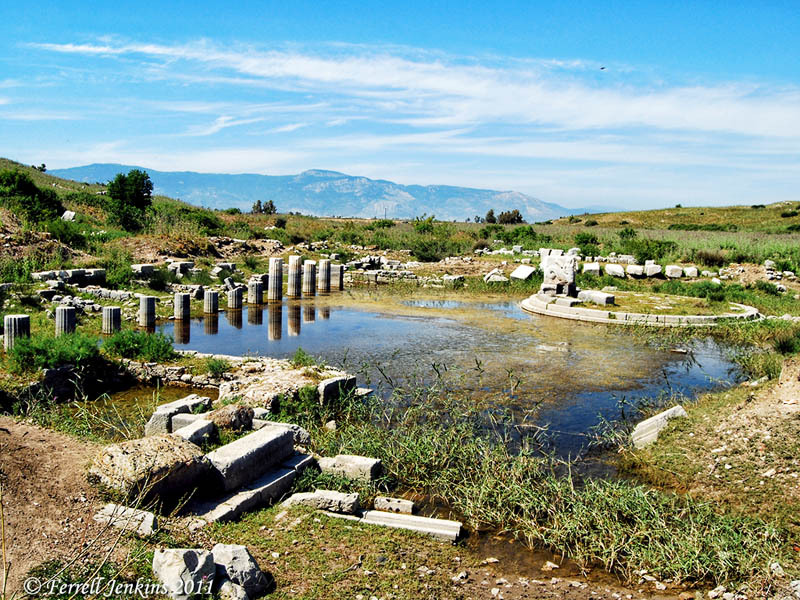 Miletus is mentioned only two places in the New Testament. The first is on Paul’s return from the third journey about A.D. 57 (Acts 20:15, 17). The other time is when Paul tells Timothy, in his last letter, that he had left Trophimus “sick at Miletus” (2 Timothy 4:20). This indicates that Paul stopped at Miletus on the voyage to Rome, but no activity is recorded. From Miletus, on the first visit, Paul sent for the elders of the church at Ephesus. In those days it would be a lengthy journey for a messenger to go from Miletus to Ephesus. The distance by land would have been about 63 miles. If the couriers went across the Gulf of Latmos (Latmus) the distance would be about 38 miles. The map below shows the location of Miletus on the south of the Gulf of Latmos. Over the centuries the harbor, fed by the Meander River (see our masthead), silted up. Today Miletus is landlocked about five miles away from the Aegean Sea. Think about how long it took the courier to go from Miletus to Ephesus, locate the elders, and for them to make their way to Miletus. Map showing Miletus and Ephesus. Map courtesy BibleAtlas.org. Paul’s speech to the Ephesian elders is recorded in Acts 20:18-38. The photo below shows the ruins of the large Harbor Monument which was built originally in 63 B.C. This monument was at the end of the Lions’ Harbor, one of four harbors at Miletus. Ruins of the large harbor at Miletus. Photo by Ferrell Jenkins. At this harbor, or somewhere very near, Paul’s ship docked. After his meeting with the elders from Ephesus, they accompanied him to the ship for his departure to Jerusalem. Tomorrow we begin the Aegean cruise portion of the tour. In the afternoon we will visit Patmos. The next day we will be at Rhodes, and the following day at Crete and Santorini. It may be difficult or impossible for me to blog during the cruise. Using the Internet on the ship would cost a fortune, and the time at port will be used for excursions. Please check each day to see if we are able to post info.